Struck in the name of Ubaidallah ibn Ziyad, as Governor from Basra to Balkh. Denomination : Silver Dirhem. Mint : Basra. Reference : Mitchiner Islamic - 28 to 31 variety. Album-12. Size : 32.4 x 33.3 mm. Weight : 4.10 grams. 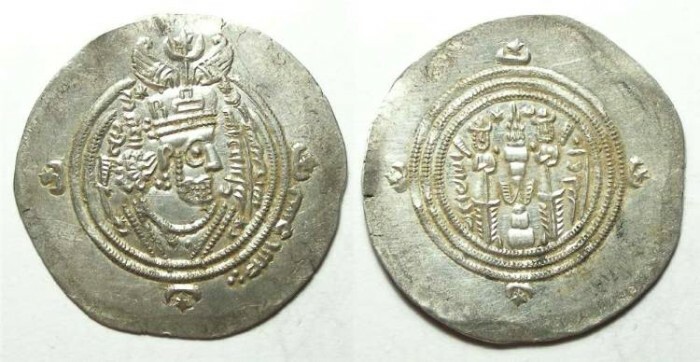 Obverse : Sassanid style King based on the coins of the Sassanian King Khusru II, with the governors name in Sassanid style script to the sides. Reverse : Sassanid style fire altar with two attendants, with the mint name to the right and the AH date to the left, in Sassanid script.